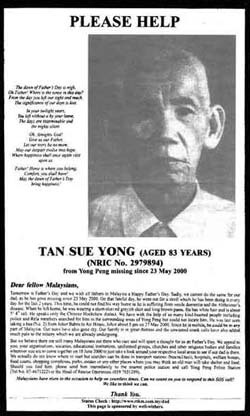 DESPERATELY SEEKING: The full-page ad in Malaysia's New Straits Times looking for Mr Tan Sue Yong.For many families, today comes with a special meal and presents - to honour the man of the house. But for one family in Malaysia, it will be yet another day fraught with worry. Their father, Tan Sue Yong, 83, is missing. He suffers from Alzheimer’s Disease and wandered off from their home in Yong Peng, Johor, on May 23. There have been sightings of the 1.6 m-tall old man but the reports always come in just a little too late. Mr. Tan is constantly on the move. By the time the family gets to where he was last seen, he has moved on. The family is so desperate that they have set up a website and put out notices in all the major Malaysian newspapers. They have also appealed to everyone to keep an eye out for their dad, who worked as a timber logger and retired at the age of 70. Mr. Roger Tan, 38, one of the sons, told The New Paper on Sunday last night that this was the second time his father had gone missing. Said Mr. Tan: “Unfortunately, my father is very fit. In 1998, he rode his 20-year-old bike to Malacca, which is at least a two-hour drive. That was in the middle of the night. Because of this incident, the family took away his motorcycle. His mother, Madam Swee Mei, 76, has been so worried that she cries all day. Mr Roger Tan has five sisters and an elder brother. He said they are not rich. The money spent on the advertisements was from their own pockets. Some were contributed by friends. Since the notices started appearing in the papers on May 28, kind wishes have poured in. Some well-wishers even set a web-site for the family at www.rtkm.com.my/dad. So far, more than 4,000 people have logged into the site. Now, they can only pray and wait. Mr Roger Tan is convinced that his father is trying to find his way back to them. But because he suffers from Alzheimer’s and dementia, he cannot remember his way home. * On May 27, the elderly Mr Tan was seen on a bus from Johor Bahru.to Air Hitam. *On June 13 at 6 pm, he was spotted at the Yong Peng Express bus station. A bus driver said Mr Tan hopped onto his bus and sat quietly. He did not have a ticket. The bus journey to the Larkin Bus Terminal in Johor Bahru took an hour. The family is worried because he hops from one bus to another with ease. And without anyone stopping him, he may now be anywhere in Malaysia.